"Critique - a self-portrait" When I was a child, my art teacher had me copy "Holbein Heads" - drawings by the great Hans Holbein, portraitist to the court of England's King Henry VIII. That was the beginning of my lifelong fascination with portraiture and my enduring respect for Holbein's genius. Even now, my teacher's voice, as she showed me the fine points of his skill, echoes in my ear: "Look for the lost and found!" This self portrait of the artist on a coffee break, in intense concentration assessing the work in progress (values? edges? gesture? composition...? ), is also my homage to Holbein, his strength of characterization and his use of color (especially in the simple rich green background). And it is nostalgic for me - a reminder of my love and gratitude for my teacher. Her work is in collections in the United States, Canada, Puerto Rico, Israel, Europe, Australia and South Africa. She is an Emeritus Member of the Salmagundi Club and the Akron Society of Artists. 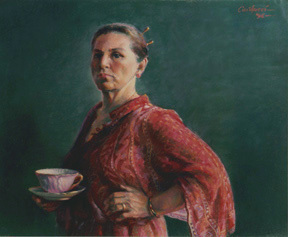 She is a Signature member of the Portrait Society of America (board & faculty) the Pastel Society of America and and Hudson Society of Artists; a juried member of the Degas Pastel Society and the Cincinnati Art Club. with her superb draftsmanship and use of color. "